Sylvain Bzikot from Puligny-Montrachet in the Bourgogne, France visited the US East Coast for about a week. I met him and and his importer, Olivier Daubresse, and tried his wines, including his Premier Cru wines at Cecile’s in McLean, Virginia. The Bourgogne is one of the most famous wine regions in the world. 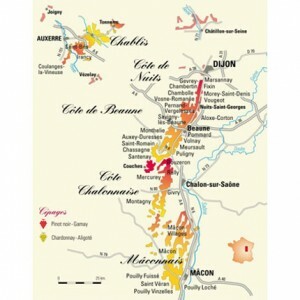 Most of the wine produced here is Pinot Noir or Chardonnay.Chablis and Beaujolais are formally part of Burgundy wine region, but wines from those subregions are usually referred to by their own names. 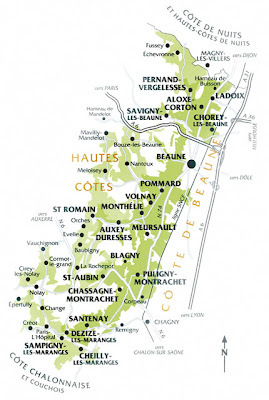 Puligny-Montrachet is in the Cote de Beaune part of the Cote d’Or, situated six miles south of Beaune. It is a small village with a population of 400 people only. Puligny-Montrachet is among the finest wine-producing villages in the world, if not the finest when it comes to white wine. There are a total of four grand crus (whole or in part) in Puligny-Montrachet. Area under production: 8.00 ha; average annual yield: 310 hl; about 2500 cases. Area under production: 11.83 ha; average annual yield: 530 hl; about 4200 cases. Area under production: 3.69 ha; average annual yield: 172 hl; about 1000 cases. 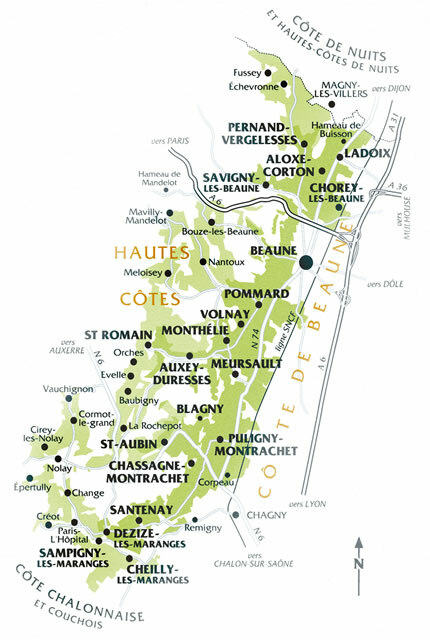 In addition, there are 23 premier crus in whole or in part in Puligny-Montrachet: Sous le Puits, La Garenne, Hameau de Blagny, La Truffière, Champ Gain, Les Chalumaux, Champ Canet, Clos de la Garenne, Les Folatières, Le Cailleret, Les Demoiselles, Les Pucelles, Clavaillon, Les Perrières, Clos de la Mouchère, Les Combettes,Les Referts. I was able to converse in French with Sylvain Bzikot. He is a very funny and entertaining guy. His English is almost non-existant. Also, the Domaine has no web site, which is not unusual in France. The Domaine Bzikot owns land in two premier cru vineyards. Tasting notes: unwooded Chardonnay, on the nose the wine shows scents of green apple skin, wet rocks and lime, in the mouth fresh and vibrant, with just a bit of butter and nut character, round and very accessible. Tasting notes: the wine has a lovely perfume of green apples, fresh butter, hazelnuts and limestone, a full-bodied wine, on the palate, very rich with good acidity, loaded with mineral and citrus fruit, lasting finish, a classic village AOC. Tasting notes: The nose opens up nicely with air, limestone, apple, chalk, a full-bodied,a full-bodied, complex wine, the palate is round and shows good richness and acidity, a wave of apple and ripe green melon flavors, coupled with notes of butter and nut elements, the finish is long and mouthwatering, a 100% Chardonnay from one of the finest vineyards in the Cote de Beaune. Tasting notes: A wonderful nose of chalk, lime and apple, a full-bodied wine, on the palate good acidity with melon notes and hints of nuts and fresh butter, a long mouthwatering finish of apple, limestone and nuts, another fine wine from a very fine vineyard. Tasting notes: A Bourgogne ordinaire, light in color in the glass, a lovely fruity nose with ripe cherry and strawberry notes, a vibrant structure and good acidity, plenty of earthy aromas and wet stone notes on the palate, long finish, a classic Bourgogne Rouge AOC. Cecilles is now Chain Bridge!